The wind was whistling as I raced across the unwaveringly straight road towards my goal – the iconic South American National Park of Torres del Paine in Chile. The landscape here invites pointless musings and philosophising, something about the featureless plain and above the immense sky, broken only by sightings of Rhea and Guanacos (South American ostrich and camelid respectively). I wondered how it was that windy (as in wind) and windy (as in lots of curves) are exactly the same word. The two meanings are seldom confused in the Patagonian Steppe. The roads are very Roman, the wind comes in horizontal and strong, and the skies stretch away forever. And so it is that the first sighting of the granite towers and walls of Torres of Paine that rise up from the plains cannot fail to take your breath away. Up there with perhaps the first glacier you see on the ship to Antarctica after crossing the Drake, or that glimpse of mist shrouded Machu Picchu after days on the Inca Trail. 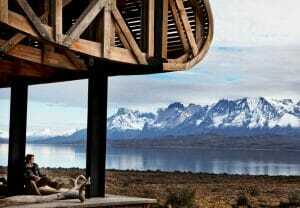 My hotel for the stay, Tierra Patagonia, was man-made but similarly breath taking. Award-winning architecture, a stunning wave-shaped façade that curves and blends into the surrounding steppe almost to the point of imperceptibility, with hundreds of perfectly framed views. In my room – one of the 40 that all face the park – I had one of those perfectly framed views all to myself. My days were busy exploring and exhilarating in the views and wildlife. 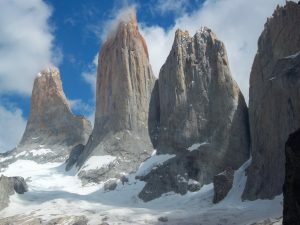 I hiked to the famous Towers one day, on another rode horses with gauchos, and on the last opted to cross the park by vehicle to Lake Grey and its glacier (just 3 of the huge range of guided excursions on offer). On my return there was the spa of course to soothe tired muscles, and in the evening the food was delicious and accompanied by fine Chilean wine (and more views). What can I say, it’s a tough job but someone has to do it.